What type of vocabulary and speech did you use during a role-play? I tried to be as professional as possible, while still being personable and accessible. This means using accurate marketing terminology when the situation calls for it. Do not be afraid to use sophisticated or otherwise rich vocabulary—without sounding like you’re just trying too hard to impress, because, of course, you still want to be relatable, friendly, and down-to-earth. Dominate the exam Some of DECA’s competitive events require participants to take an exam. Questions on DECA’s competitive events exams are designed around each career cluster. Here are a few tips for success. •	Study the appropriate performance indicator lists for your exam at www.deca.org/competitions/highschool. These are the foundation for questions that can be asked on the exam. •	Utilize study groups. Since DECA only offers five exams, find DECA members that are taking the same exam as you and study together. •	Use previous exams for practice and familiarization with the format. •	Review your math skills. 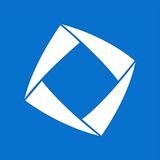 •	Research unfamiliar terms or ask your DECA advisor or business professional for guidance. 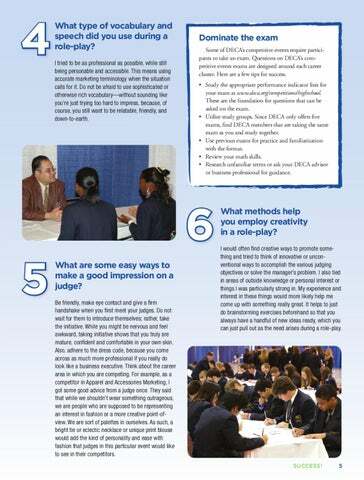 6 What are some easy ways to make a good impression on a judge? Be friendly, make eye contact and give a firm handshake when you first meet your judges. Do not wait for them to introduce themselves; rather, take the initiative. While you might be nervous and feel awkward, taking initiative shows that you truly are mature, confident and comfortable in your own skin. Also, adhere to the dress code, because you come across as much more professional if you really do look like a business executive. Think about the career area in which you are competing. For example, as a competitor in Apparel and Accessories Marketing, I got some good advice from a judge once. They said that while we shouldn’t wear something outrageous, we are people who are supposed to be representing an interest in fashion or a more creative point-ofview. We are sort of palettes in ourselves. As such, a bright tie or eclectic necklace or unique print blouse would add the kind of personality and ease with fashion that judges in this particular event would like to see in their competitors. What methods help you employ creativity in a role-play? I would often find creative ways to promote something and tried to think of innovative or unconventional ways to accomplish the various judging objectives or solve the manager’s problem. I also tied in areas of outside knowledge or personal interest or things I was particularly strong in. My experience and interest in these things would more likely help me come up with something really great. It helps to just do brainstorming exercises beforehand so that you always have a handful of new ideas ready, which you can just pull out as the need arises during a role-play.